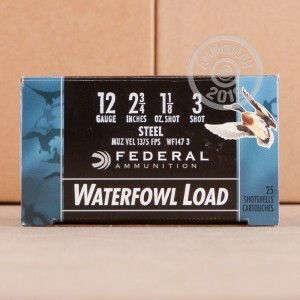 These 12 gauge shells from Federal's Speed-Shok series fire #3 steel shot for good penetration against larger species of waterfowl. Each 2-3/4" shell in this box of 25 fires a 1-1/8 oz. payload at a high muzzle velocity of 1,375 feet per second. Federal Speed-Shok shells are loaded in Anoka, Minnesota. 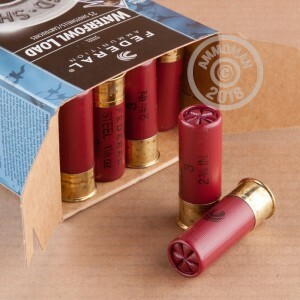 They are compliant with all laws requiring the use of lead-free or non-toxic ammunition in wetland environments. 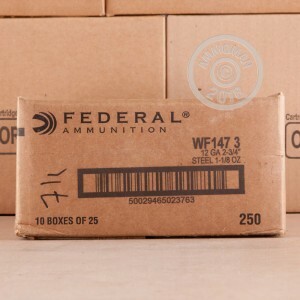 Grab a few boxes of this load or mix and match calibers--whatever suits your needs. Remember, all orders at AmmoMan.com in excess of $99 come with free shipping!